The Google Trends graph above demonstrates that online funeral plan searches are increasing year on year, opportunities for Marketing Funeral Plans Online exist in line with the consistent growth of funeral plan sales. Plan sales in 2005 were 60,145 increasing to 207,700 in 2017 https://funeralplanningauthority.co.uk/statistics/ . 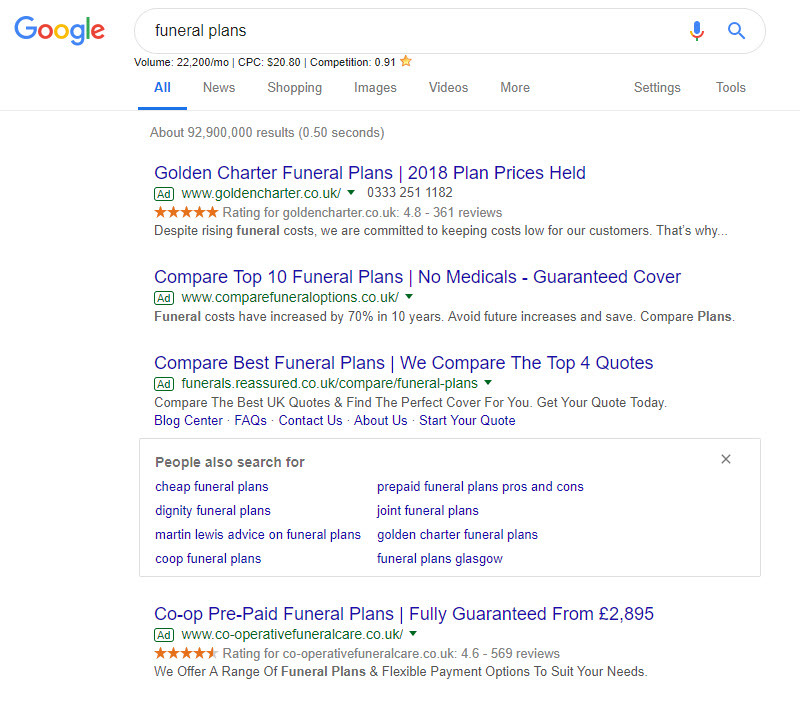 Your Website - Although your funeral plan marketing strategy may continue to include both offline and online promotion, in this article we’ll consider online opportunities. Publishing informative articles on your website represents a content marketing opportunity that is worth pursuing for any business. Online marketing of your funeral plans should centre around your website as part of an overall Content Marketing strategy. Whether that be your conventional funeral business website where you can add blog posts and articles free of charge by gaining access to the content management system or a more progressive dedicated funeral plans website such as https://www.funeralplansnewcastle.co.uk/ or https://funeralplanskelso.co.uk/. There are opportunities to gain a significant advantage in the online market place by having a separate funeral plans dedicated website. Find out more. Channels - Such as social media can play a vital role in marketing your funeral plans but ultimately the purpose of that is to drive traffic to your website as the hub of your funeral plan information. Social media offers a significant opportunity to drive people to your website with potentially more enquiries and future business without spending money on advertising. Your website represents a digital presence that you can control; your online shop front to potential funeral plan customers as opposed to social media platforms owned by another company with their restrictions. You can decide exactly how to present funeral plans to your website visitors, your branding or plan provider branding, colours, words, videos, blogs and other content is for you to control in line with advertising standards and industry compliance. 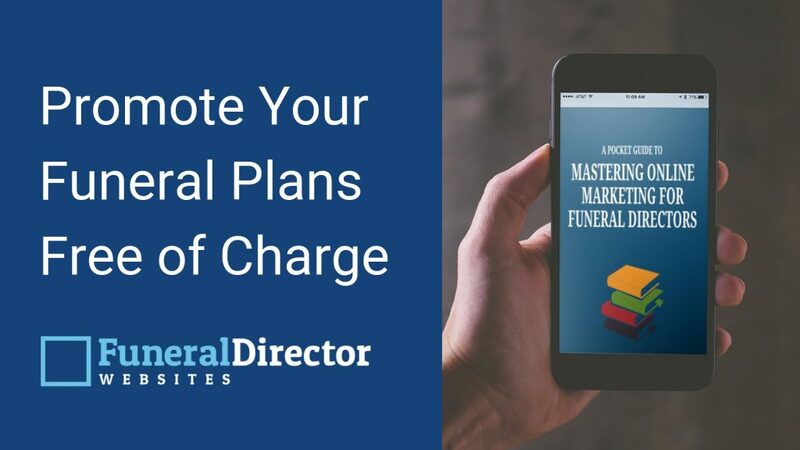 Funeral plans are a competitive market, many providers are visible online and it's likely that your potential customers are aware of them and will be checking them out. The question is, are your competitors providing the clarity people are looking for? By providing that clarity, by explaining the distinctions between your offering and those from other providers, you have the opportunity to gain trust. 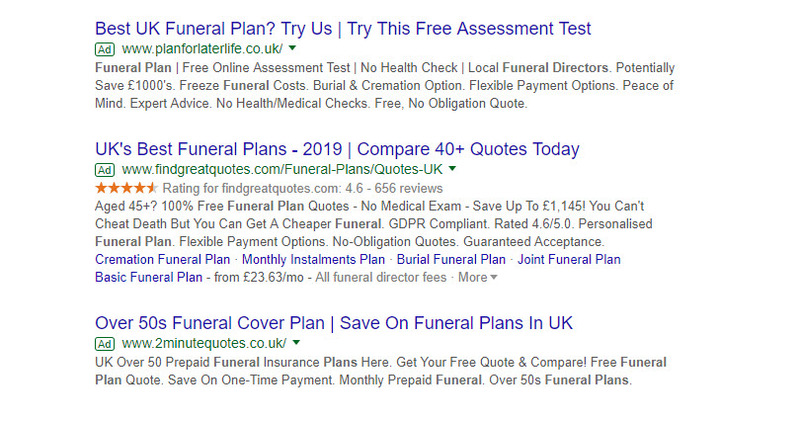 Your aim is to be found on page one of a search engine for ‘funeral plan’ searches in your area. Competition is fierce, achieving consistent results using paid for 'Pay Per Click' advertising may prove costly. A more realistic option may be to aim for a search term in local ‘organic’ search results i.e. creating and publishing content on your website that is optimised for your town. Search results confirm that locally optimised content from smaller businesses can perform well in local search results against corporate competitors. Similar to the strategy of a dedicated funeral plans website, create a Facebook Page specifically for your funeral plans. Post regularly on the page and also post funeral plan content on your main Facebook page. The images above illustrate the current proliferation of Pay Per Click advertising by organisations with large advertising budgets. While this may be effective in certain scenarios it can also be expensive with no guarantees of success. Content Marketing, in the form of good quality in depth information on your website provides an alternative that can provide long term results. The graphic above shows popular search terms that people have used when researching a funeral plan purchase. Each of these represents the opportunity to write an article on your website that is potentially search engine friendly . Discuss the market - People are seeking clarity, they are interested in cost but not everyone is interested solely in finding the cheapest provider. Address the question of the whole market taking full account of your competitors and your position in the market. What determines cost? - Explain the components of a funeral plan cost that can drive the price up or down, why the cheapest are cheap and why the most expensive are expensive. What are the factors that influence cost? Video - Include a video on your website for the benefit of people who prefer that format, this will also be more shareable than text content therefore a more effective marketing asset. Make the video factual and helpful as opposed to sales orientated. Price Calculator - Include self-selection pricing so people can configure their own package with an approximate cost. Self selection is not just the future of the digital buying experience, it’s the present! Seek guidance from your funeral plan provider when promoting funeral plans to ensure that pre-sales information accurately reflects the product features. Ask your funeral plan provider to provide content guidelines and to proof read content before you publish. Further information can be found on the Funeral Planning Authority website and UK Government Website. Would you like help with marketing funeral plans online? Funeral Director Websites offer a specialist service for funeral directors, we can help with Web Design, Search Engine Optimisation, content writing and social media strategy.